Research shows that early school start times can negatively impact the health, and academic outcomes, of young people. Most recommendations indicate that schools shouldn’t start any earlier than 8:30am, but across the US, many schools continue to ring that first bell at 7:30am and earlier. The American Academy of Pediatrics (AAP) believes schools should move start times to 8:30 or later for primary and high schools, so that students can get the recommended 8-10 hours of sleep a night. “Students are at risk of adverse consequences of insufficient sleep, including impairments in mood, affect regulation, attention, memory, behaviour control, executive function, and quality of life,” a report by the Academy said. Dr Sandy Chung, who represents the Virginia chapter of the AAP pointed to an official policy by the Academy which recommends later school start times to improve students’ health. “Chronic sleep loss in children and adolescents is one of the most common and easily fixable health issues in the United States today,” she said. Unlike Dr Chung, Phyllis Payne, co-founder of SLEEP in Fairfax, said fixing the problem is more difficult than many take for granted. “The first districts that were making these changes were making them in the 90s. The fact that we’re still talking about this in 2018 is a reflection of how hard it is to accomplish,” Payne told Healthline. For parents who are interested in learning more about how they can help convince their school district to begin making this shift, the organisation Start School Later has tools and success stories from parents who have been able to make a difference. According to Payne, it’s one of the best things parents can do for their kids. “To be an active, involved learner in the classroom, you need to be well-rested,” Payne said. Later school start times may also have benefits for teachers and principals. In addition to improving their own health, later school start times can also reward school teachers and principals with happier and more conscientious students. According to the conclusions of the report, students are likely to display significant improvements in health and academic success in association with later school start times. ‘Delaying school start times is an effective countermeasure to chronic sleep loss and has a wide range of potential benefits to students with regard to physical and mental health, safety, and academic achievement,’ the report stated. Convincing schools to enact changes to their start times may involve a lot of work, but proponents of the idea just might have an ace in the hole. 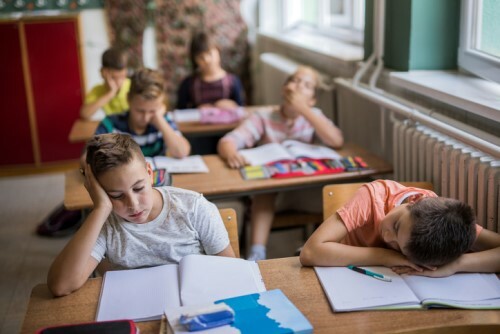 In addition to improving student health and performance, preventing student sleep deprivation can be “potentially highly cost-effective” for schools, according to the report. This is backed up by a recent Brookings Institute Report, in which 63 economists suggested that delaying school start times would have a substantial benefit-to-cost ratio (9:1). This finding was based on a conservative estimate of ‘both costs per student and the increase in projected future earnings per student in present value’ because of test score gains related to moving start times one hour later.